Junior dos Santos embarrassed Cain Velasquez (pictured) in their initial encounter by putting him to sleep in merely 64 seconds. What made matters worse was it happened on the UFC’s debut on FOX, and it was the only fight scheduled to air during the live hour-long broadcast. That left FOX’s panel with nearly 45 minutes of television time to criticize Velasquez for attempting to stand with the brawler instead of showcasing his wrestling game and replay the lights out KO to no end in slow-mo and super-slow-mo. Their first shootout may have only lasted 64 ticks, but the memories from that night haunted Velasquez for several months. It probably will forever. That’s why Velasquez had to return the favor in December’s rematch. 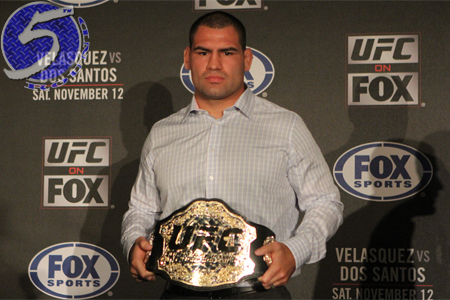 However, Velasquez knew that if he evened up the score to reclaim his throne, a trilogy was inevitable. That’s why he went out of his way to prove a point. Velasquez was clearly the better man right from the opening bell in their sequel. There were several occasions where he had dos Santos hurt, but opted to methodically brutalize him instead of going for a submission or TKO to end the mauling. According to UFC president Dana White, Velasquez wanted to send his rival a violent message. If Velasquez was trying to deliver a message, what was received on dos Santos’ end was that he “hits like a girl.” Something must have been lost in translation, because the Brazilian’s face was bloodied, battered and swollen up like a balloon after Velasquez unleashed his assault. Velasquez gets to see if his girly punches will be enough to take the lead in their rubber match this Saturday at UFC 166.